Legislation aimed at improving Wisconsin’s chances of claiming federal funding is now law. 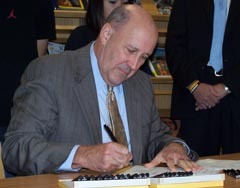 Governor Jim Doyle on Monday signed four bills during a ceremony at Madison’s J.C. Wright Middle School, the same location where President Obama discussed education reform just last week. Doyle says the provisions are necessary for the state to compete for the “Race to the Top” program, which is making over $4 billion available for education. The legislation allows state education officials to track student achievement data, creates new standards for charter schools, offers help for Milwaukee Public Schools to close the racial achievement gap, and lifts a prohibition on using student test scores to evaluate teachers. The package of bills is just part of the state’s efforts to improve its “Race to the Top” application. Governor Doyle says other legislation he is still pushing for would put MPS under mayoral control and allow DPI to take over failing schools. The Governor says he hopes lawmakers can approve those measures before the end of the year.